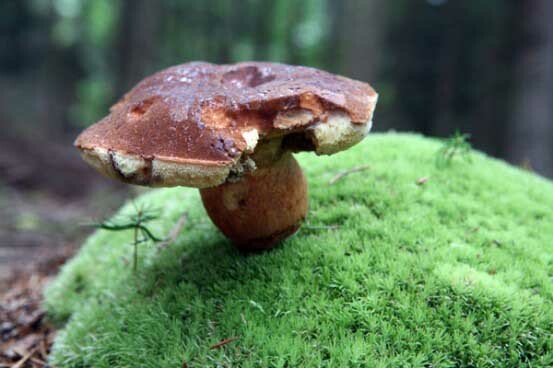 Fungi are an incredibly important part of healthy soils. These days, you may often hear the term Mycorrhiza Fungi used when someone is referring to beneficial fungi. So, what exactly is this stuff? Basically, “myco” means fungus and “rhiza” means root. These special fungi will establish a beneficial connection with plant roots and aid them with the uptake of water and nutrients. When we speak of “fungi”, a mushroom like that in the photo is probably the first thing that comes to mind. But that's not the kind of fungi we're talking about here. We'll have to go beneath the soil to discover beneficial mycorrhizal fungi. If you’ve ever noticed long white root-like structures in your soil, especially where you have mulch that may be breaking down, what you’re probably seeing is the mycelial fillaments of fungi – they themselves look like roots. Homeowners often mistake these white threadlike structures as something that is bad for their plants, but it’s just the fungi doing its job! mycorrhizal fungi creates simlar filaments that extend from the plant's roots. Did you know that more than 90% of plants on Earth develop a symbiotic relationship with beneficial fungi? The mycorrhizal fungi multiply inside the plant’s roots, then send out filaments that help the plant better absorb water and nutrients. They essentially increase the surface area of the plant’s root system and also release enzymes that break down nutrients that may be bound up in the soil. Organic Nitrogen can often be difficult for plants to absorb without the aid of mycorrhizal fungi. When you till the soil, remove topsoil, compact your soil over time or regularly use chemicals in your lawn and landscape, you can lose much of your beneficial mycorrhiza. Aerating the soil and stimulating it with liquid compost can help regenerate natural populations. You can also use garden amendments that contain mycorrhizal fungi. Adequate levels of mycorrhizal will help your lawn use less water and better absorb the nutrients it needs.